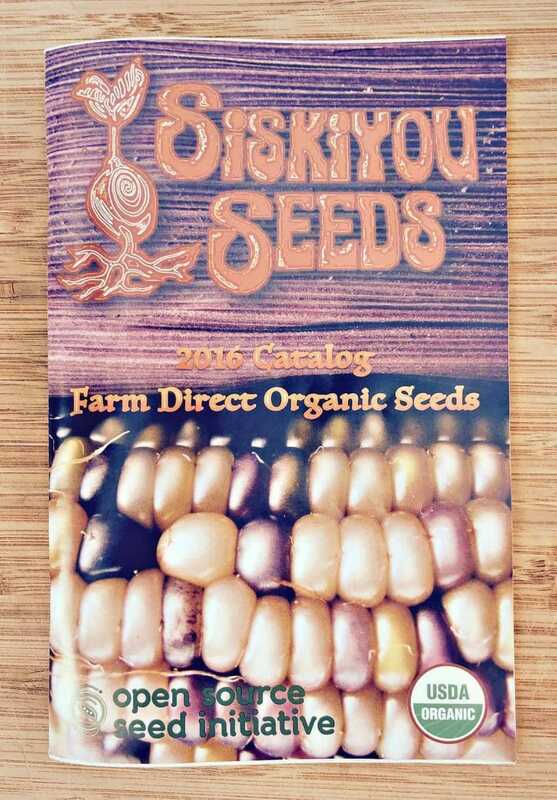 It’s that time of year when those of us with the gardening bug find extreme pleasure in pouring over seed catalogs. I must admit it’s one of my favorite winter pastimes. In fact, as I write this, we are having a gorgeous spring like day that is making me so excited to get out and start planting! But, I know that winter isn’t over yet and I must wait. Luckily I happen to live in an area where spring comes quickly, so it shouldn’t be too long before I can get my radish seeds in the ground, followed by some hardy greens. For now, though, I will be circling and highlighting and dreaming of all the seeds that I want to buy for my little garden! 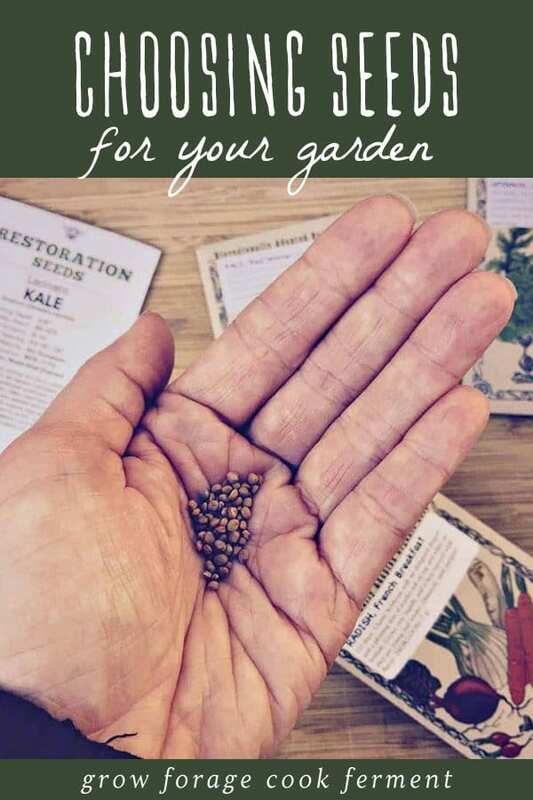 Today I’m going to talk with you about how to choose the right seeds for YOUR garden, as it can be a daunting task to go through all the catalogs that you’ve acquired and determine what is going to work well for you. It can be tempting to buy one of everything (trust me, I’ve done nearly that some years! ), but there can be a method to the seed buying madness. You may be thinking, “What varieties of tomatoes should I choose? Should I get open pollinated, non GMO, heirloom, organic or hybrid seeds, and what is the difference between them? What seed companies should I buy from, and does it even matter? Does my hardiness zone play a role? Should I plant eggplant seeds even if I hate eggplant?” I’ve got answers! Let’s talk all about seeds! Which Seed Companies Should I Buy From? This is a good place to start, because at first glance it may seem like all seed companies are alike. It would make sense then that you should just go for whatever is the cheapest, but this is most definitely not the case. 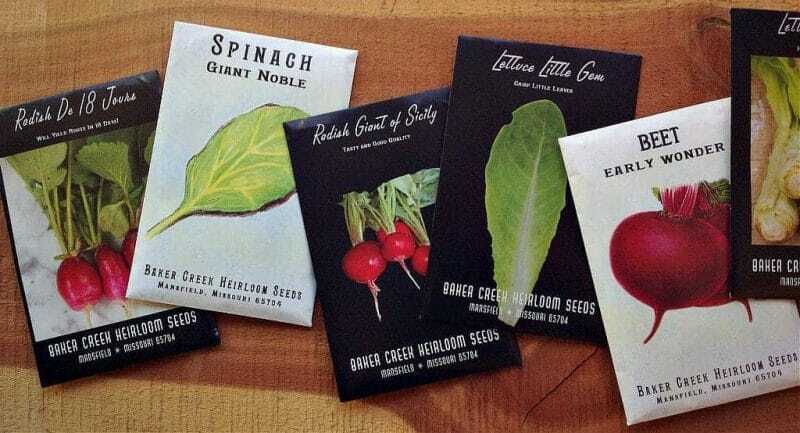 My very first choice when choosing seeds is to go with local companies, which for me here in Southern Oregon is Restoration Seeds and Siskiyou Seeds. While part of this is because I believe in supporting local businesses, the main reason is because local seed providers have developed seeds that are adapted to your specific region. This means that they will generally grow better for you and have more vigor. If you don’t have any local seed companies, or if the local ones don’t carry all the seeds you want, go for the bigger seed companies that are known for having high quality seeds and are forthcoming about where their seeds come from. A few of my favorites are Baker Creek Heirloom Seeds, Seed Savers Exchange, and High Mowing Organic Seeds, but there are many more out there. Baker Creek puts out an amazing catalog every year that is coveted by gardeners all over the country. 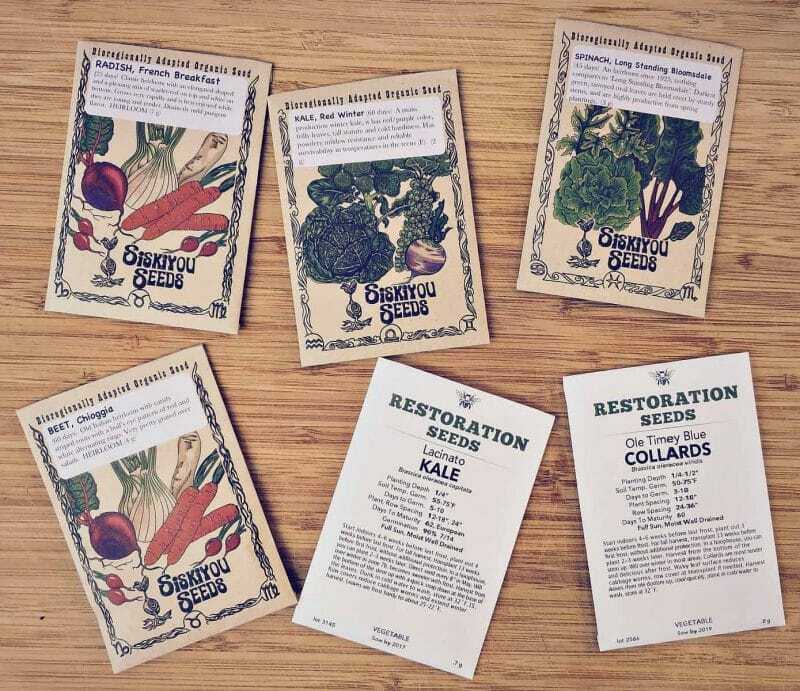 What Do Different Seed Labels Mean? It can be tough to decipher what all of the different labels mean and whether you should care about them or not. This of course is a personal decision, but I will let you know my thoughts on them. Open Pollinated – The seeds that you get from these plants will “breed true”, meaning they will produce plants that are the same or very similar to their parents, which is important for seed saving. Hybrid – These seeds are a result of crossing two different varieties of plants. The resulting plants will often have more vigor, but their seeds will not “breed true”. Heirloom – These are seed varieties, usually open pollinated, that have been saved over many generations. Organic – These are seeds that come from plants that comply with USDA organic standards. Non-GMO – These are seeds that are not grown with “recombinant DNA technology”. Any type of seed can be GMO (open pollinated, hybrid, heirloom), unless it is certified organic or non-GMO. To me, the most important of these labels is for the seeds to be non-GMO, as I don’t think genetically modified seeds have any place in my garden. While the organic label does mean non-GMO, I’m not as worried about whether the seeds are technically “organic” or not. 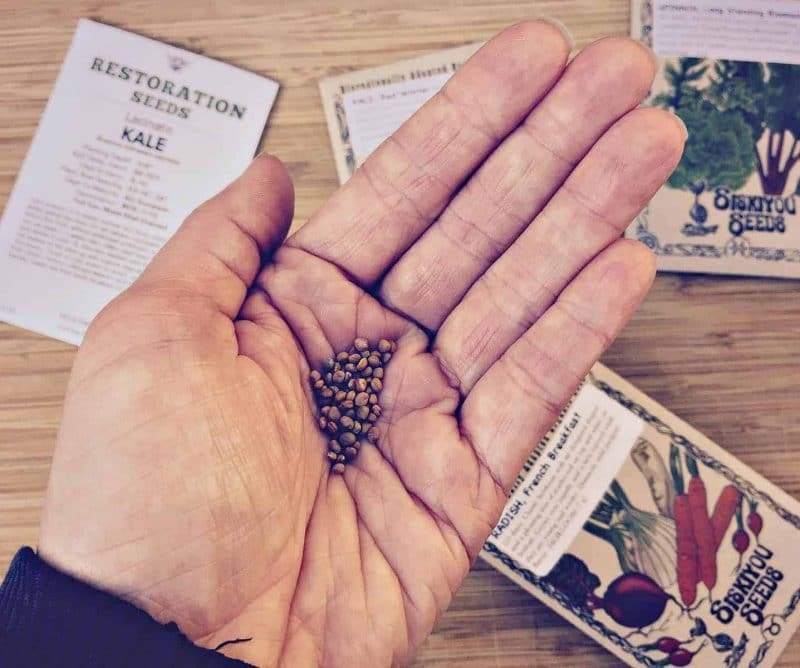 I generally think that open pollinated and heirloom seeds are awesome and you can get some really cool, old varieties that have been tested through time. These are also what you want to get if you have any plans on saving your own seeds. While some people are against hybrid seeds, I think they do have a place in the garden (as long as they’re non-GMO that is). These plants will often have “hybrid vigor” and produce extremely well, which is always fun. Just don’t expect that the seeds of those plants will produce anything similar! Which Seeds Should I Choose? Choose what you like to eat – This is simple enough. If everyone in your family absolutely hates eggplant, then don’t grow eggplant (even though there are really cool stripey varieties that you really, really want). That said, homegrown veggies have a way of making people like things that they didn’t think they ever would, so sometimes it doesn’t hurt to try. Just don’t go overboard with it. Choose what grows well in your region – This is why I recommend buying from local seed companies, as they will have the right kind of seeds for your region and zone. Besides that, if you live in an extremely hot climate you probably won’t do well with cold loving plants, and vice versa. Do research on what has been traditionally grown in your area (hot peppers in New Mexico, for example). 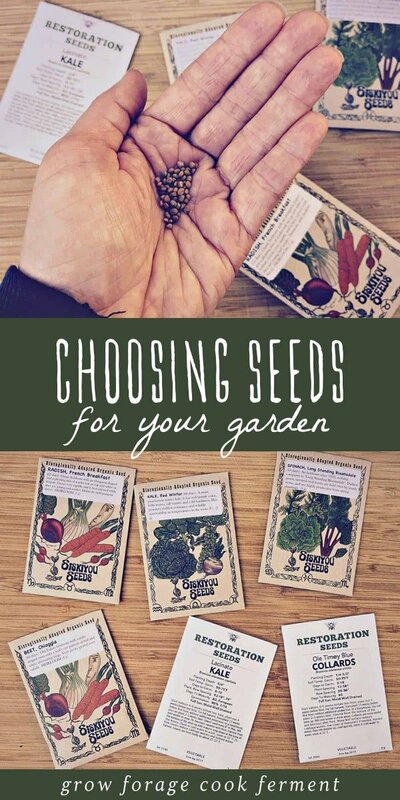 Choose a variety of seeds – Don’t get all tomatoes! Get some salad greens, peas, peppers, zucchini, carrots, basil and kale. Get some varieties that like to be planted early in the season and others that like to be planted later. Get roots and vines and herbs and leaves and flowers and fruits (tomatoes are fruits, you know). If your family loves kale, get a few different types and see which one is your favorite! Choose seeds based on your goals – Are you planning on doing a whole bunch of canning or dehydrating in the fall? Then buy a good amount of those seeds that will help you with that. Do you love to make pesto? Get a whole bunch of basil seeds! Get something new to you – This is just my own personal recommendation, but I always think it’s great to try something new. Just try one thing you’ve never had or grown before and see if you like it! Usually homegrown food tastes a bazillion times better than food from the grocery store (<— scientific fact), so if you’ve never been inclined to buy that withered old turnip from the store it’s worthwhile to try and grow it yourself. You never know, you may decide that turnips (and their greens) are the bees knees! Try not to over think it! While I don’t recommend spending an entire month’s income on seeds, it’s ok to go a little bit crazy with it (I might be trying to justify my own behavior here). Buy from a few different sources and see which one you like best. Let your kids pick out a seed packet of their choice and that can be their plant to water and watch grow… and eat! You might be surprised by what they pick. 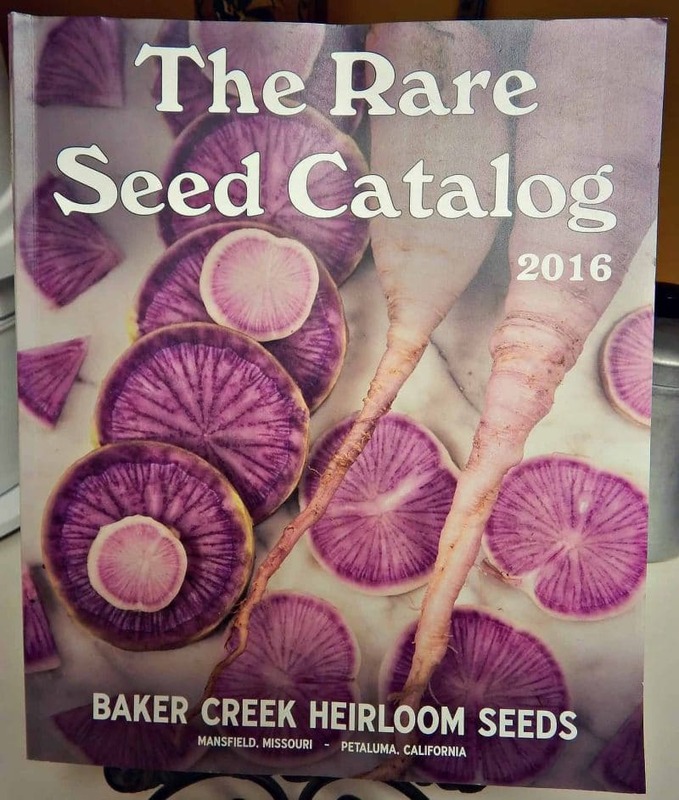 Really though, going through seed catalogs is like planning your future… your future of good, healthy food! Soon we’ll all be out in the sunshine, getting exercise and planting seeds. I can’t wait! Previous Post: « Updates and Recent Happenings: What Happened to the Garden? We are in the process of seed orders too. One of our favorite things is playing in the dirt! Last year we did what you suggested- tried something new. We grew some Blue Beauty Tomatoes from Baker Creek/Rare Seeds and absolutely fell in love with these tomatoes. They will be in our garden for sure this year. We also grew Blauhilde Bean – a very long purple green bean that had beautiful purple flowers and pods. Some of the best pole beans we have grown (also from Baker Creek). They had a very rich flavor. Thanks for the new seed sources! We will try a few out.